The idea of the code generation framework is to provide a way to independently customize different extension points. The figure below presents the 8 different extension points we have identified. Current implementation of the framework supports customizing all those extension points. However, at this point all developers are encouraged to propose and implement refactoring in order to make the APIs clear and as decoupled as possible. The figure above presents the 8 extension points of the HEADS code generation framework. These extension points are separated in two groups: the ones corresponding to the generation of code for Types or "Things" and the ones corresponding to the generation of code for the Instances or Configuration. This part of the code generator corresponds to the code generated for actions, expressions and functions contained in a Thing. The generated code mostly depends on the language supported by the target platform (C, Java, etc. ), and the code generators should be quite reusable across different platforms supporting the same language. The implementation of this extension point consists of a visitor on the Actions and Expressions part of the metamodel. New code generators can be created by inheriting from that abstract visitor and implementing all its methods. Alternatively, if only a minor modification of an existing code generator is needed, it is possible to inherit from the existing visitor and only override a subset of its methods. This part of the code generator corresponds to the wrapping of "things" into reusable components on the target platform. Depending on the target platform, the language and the context in which the application is deployed, the code generated for a "thing" can be tailored to generate either custom modules or to fit particular coding constraints or middleware to be used on the target platform. At this level, a Thing is a black box which should offer an API to send and receive messages through its ports. In practice this should be customized by the platform experts in order to fit the best practices and frameworks available on the target platform. As a best practice, the generated modules and APIs for things should be manually usable in case the rest of the system (or part of it) is written directly in the target language. For example, in object oriented languages, a facade and the observer pattern can be used to provide an easy to use API for the generated code. In C, a module with the proper header with structures and call-backs should be generated. This part of the code generator is in charge of generating the code corresponding to the connectors and transporting messages from one Thing to the next. This is the client side of the APIs generated for the Things. In practice the connector can connect two things running in the same process on a single platform or things which are remotely connected through some sort of network (from a simple serial link to any point to point communication over a network stack). The way the code is generated should be tailored to the specific way messages should be serialized, transmitted and de-serialized. In order to customize this part of the code generator, the HEADS framework offers a set of helpers which allow listing all messages to be transported and pruning unused messages in order to generate only the necessary code. The dispatch and queuing of the messages has been separated out from the serialization and transport in order to allow for more flexibility. This part of the generator is related to the connectors and channels but is specifically used to tailor how messages are handled when the connectors are between two things running on the same platform. When the connectors are between things separated by a network or some sort of inter-process communication, the asynchronous nature of messages is ensured by construction. However, inside a single process specific additional code should be generated in order to store messages in FIFOs and dispatch them asynchronously. Depending on the target platform, the platform expert might reuse existing message queues provided by the operating system or a specific framework. If no message queuing service is available, like on the Arduino platform for example, the code for the queues can be fully generated. This part of the code generator is in charge of generating the code which orchestrates the set of Things running on one platform. The generated code should activate successively the state machines of each component and handle the dispatch of messages between the components using the channels and message queues. Depending on the target platform, the scheduling can be based on the use of operating system services, threads, an active object design pattern or any other suitable strategy. This part of the code generator is in charge of generating the entry point and initialization code in order to set up and start the generated application on the target platform. 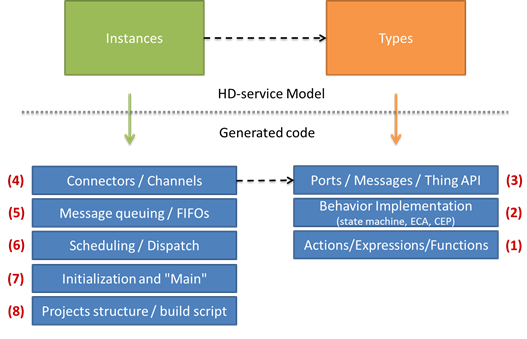 The HEADS transformation framework provides some helpers to list the instances to be created, the connections to be made and the set of variables to be initialized together with their initial values. The last extension point is not generating code as such, but the required file structure and builds scripts in order to make the generated code well packaged and easy to compile and deploy on the target platform. The HEADS transformation framework provides access to all the buffers in which the code has been generated and allows creating the file structure which fits the particular target platform. For example, the Arduino compiler concatenates all the generated code into a single file which can be opened by the Arduino IDE. The Linux C code generator creates separate C modules with header files and generates a Makefile to compile the application. The Java and Scala code generators create Maven project and pom.xml files in order to allow compiling and deploying the generated code. The platform expert can customize the project structure and build scripts in order to fit the best practices of the target platform. How to write a (family of) compiler(s)? For the different extension point we have presented earlier, we will use concrete compilers that we have implemented to show how to write your own compiler. To illustrate the HEADS Action compiler and show how to implement a family of compilers, we will take the example of the C family, composed of two compilers: Linux/POSIX and Arduino. Those two compilers share most of their code and re-define a few extension points for the parts where they differ. Both approaches have pros and cons. 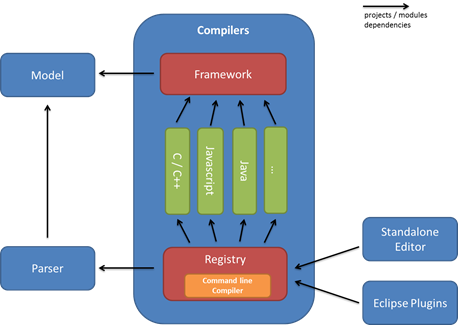 Using a framework typically reduces the size and complexity of the code to be generated (and of the compilers), as most of the code is directly written in the framework. However, frameworks tend to be generic and might typically include more than what is needed, hence have a larger overhead. The full generative approach gives more flexibility and makes it possible to control each bits and bytes, and optimize the code for a particular state machine (whereas the framework needs to handle any possible state machine), but are typically more complex to implement. Plaform experts are however encouraged to implement the generateImplementation method in a modular way, split into several sub-methods. Based on its extensive suite of tests, the HEADS transformation framework was able to detect a few bugs in the popular state.js library (~200 likes on GitHub and ~1000 Download a month on NPM), that were rapidly fixed by the repository maintainer. This extension point allows customizing the code generated for handling how the messages and the control are distributed among of set of component instances. From a semantic point of view, each component instance is an independent process which exchanges messages with other components in an asynchronous way. To implement this semantic, a wide range of alternatives for queuing messages, distributing them to the components can be used depending on the capabilities of the targeted platforms. Features for message exchange and multi-tasking are typically provided by operating systems or middleware platforms. In the case of resource constrained devices with no operating system, code has to be generated to fully handle the scheduling and message dispatch between components. The API for customizing the code generator for those aspect is in class "org.thingml.compilers.configuration.CfgMainGenerator" and its sub-classes for the different platforms. The example bellow shows how messages are queued when generating code for microcontrollers. The generated code includes a compact FIFO implementation for storing messages. The messages are serialized in the FIFO when they are emitted by a component and later processed and dispatched to the receiving components. The following listing shows how the messages are dispatched from the FIFO to the appropriate component. In the Arduino code generator, the main loop of the scheduler simply activates the components which use polling and processes messages from the queue. The component receiving a message is given the CPU for processing this message. Any message produced by the component is queued and will be later processed by the receiver. This strategy ensures that each component gets activated in turn and that the processing of a message in executed as a whole. In the case of microcontrollers, it can be interrupted by microcontroller interrupts but not by the processing of another message. Depending on the level of dynamicity required, code can be generated statically for one particular configuration (and set of connector), but even on tiny and small targets code can be generated to handle dynamically dispatching messages according to a dynamic set of connectors. The code bellow illustrates how it is done in the Arduino compiler. When new target languages, operating systems or core libraries need to be supported, the platform expert has to extend the ThingML compilers/transformation. The ThingML compilers are modular so that different parts can be reused and extended separately. ThingML supports for adding annotations on most elements of the language. The platform expert can define specific annotations which are exploited in the code generator in order to support platform specific features. For example, a thing dealing with IO typically needs to listen continuously for inputs to arrive. This behavior should be executed in a separate thread so that it does not block or slow down the execution of the core business logic. This multi-threaded behavior can be achieved in the Linux/C compiler using the @fork_linux_thread annotation. If an annotation is intensively used and relevant for most compilers, the concept can be promoted directly into the language so that it can be benefit from better tool support (annotations being simple string-based key/value entries). The extension of the HEADS modelling language is however beyond the scope of the HEADS project, but interested reader can read about the way we extended the language to support Complex Event Processing.